Avoid this truck. Overpriced, under served and indifferent attitude of servers. Today was my first, and last, time eating at this truck! The only reason I give them one star is I could not submit this review unless I selected a star. I wouldn't give them any stars if possible. Worst truck ever!!! Really good. Maybe a little too expensive but great food. I waited a long time for my food, which wouldn't have been a problem if my entire order was given to me. I didn't realize I only received ONE beef patty with coco bread until I walked all the way back to my office (and I definitely paid for two). I reached out to them on Twitter and the only thing they had to say was "we hope you give us another opportunity". They owe me a beef patty! The one beef patty that I did get to eat was delicious though. I'm only giving them 3 stars because of the poor customer service. The food is delicious and the server is polite. However, the truck's schedule is not consistent at all. They would get a lot more business if they post where they'll be and actually show up. I went looking for something soft to eat after dental work, and figured the mac & cheese plus some blackeyed peas would do. Not only were they easy to chew, they were delicious! I can't wait until I can try their meats. I'll come back every time they show up. How come you don't have a FB fan page? I just gave you a shout out. lol. The food was wonderful. I'm still eating it from a couple of hours ago. Great sized portion. It even tastes good, cold. Hope to see you around Navy Yard again soon. EXCELLENT...and they were so nice. 1st time visitor. I ordered the brisket, which was tendor, but a small portion. The Mac & Cheese was different. The Collard greens had a nice smokey flavor. $12 is asking way way to much for the portions. The greens were very good the mac & cheese didn't have that much cheese and the chicken wasn't really seasoned and mine was still red on the inside ans also I guess the price went up because I paid $12 for the meal and their web site says $10 for roasted chicken w/ two sides. I got the roasted chicken and mac n cheese,both were bland. They ran out of fish and greens. I won't be going back to this truck.You ask for lemonade and they give you limeade. What's on the website is not the same as whats on the truck, maybe the restaraunt is better. 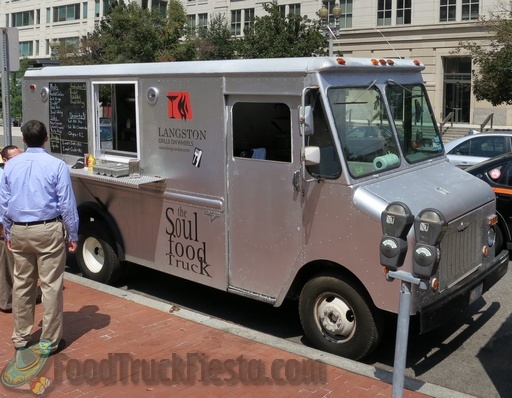 Langston Grille on Wheels is a new soul food truck that opened on August 19, 2011. 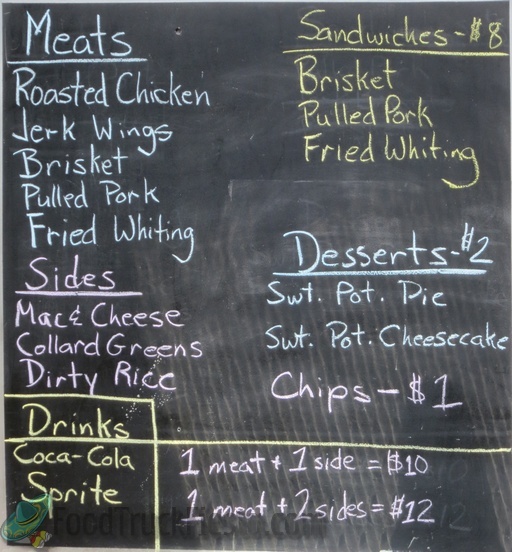 The Langston Grille is the mobile component of the Langston Bar & Grill located at 1831 Benning Road, NE. The owner of the Cajunator food truck was on board to help out during the opening day of the Langston Grille On Wheels. The truck was last seen serving in October 2012 and presumed to be retired.